Mark is the Director of Corporate and Community Relations, responsible for initiating and managing BIOS’s relationships with Bermuda-based individuals and organizations interested in supporting BIOS’s activities. As a senior member of the Development, Marketing, and Communications team, Mark is in charge of the local effort to promote BIOS’s scientific and educational programs. Mark also leads the strategic development of the Risk Prediction Initiative, retaining his responsibilities for the overall program. Prior to joining the Development Team in August 2015, Mark was Program Manager of the Risk Prediction Initiative (RPI) at BIOS, with responsibilities for supervision of all RPI activities. 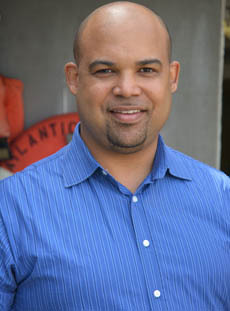 Mark is a qualified meteorologist, with 15 years’ experience in the Bermuda Weather Service, and was its Director from 2006-2012. His research into Atlantic hurricanes and subtropical storms led him to obtain a PhD in Meteorology from Penn State University, following a Master’s degree from the University of East Anglia. Mark has experience as an operational forecaster with training from the UK Met Office and the US National Hurricane Center. He has served on intergovernmental committees focusing on warning and mitigation of natural hazards, and has also worked as a reinsurance analyst and catastrophe risk modeler. He also served as an adjunct faculty member of BIOS 2009-2012.